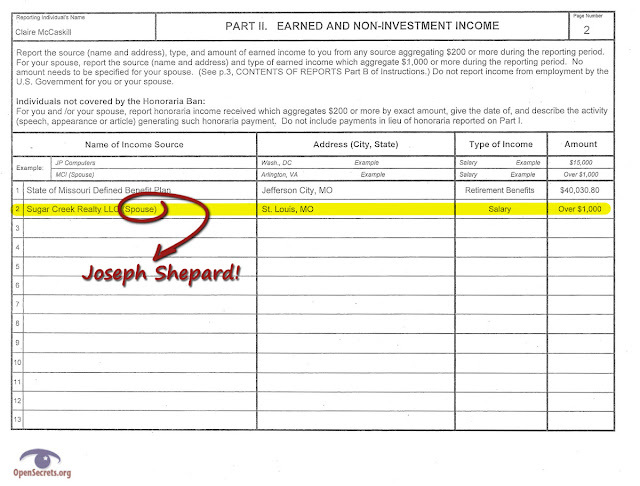 Joseph Shepard's business empire worth millions of dollars was built on public policies supported by Claire McCaskill that incentivize the construction of low-income housing by offering both state and federal tax credits. I believe that these policies have fostered a poverty-industrial complex that enriches a small elite like Shepard and McCaskill at the expense of tax payers. 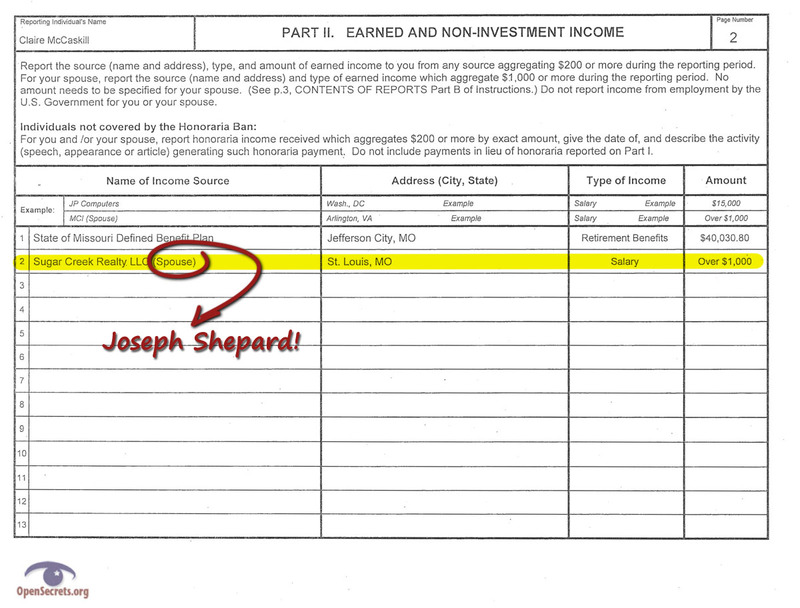 Below I examine one of Shepard's umbrella companies, Sugar Creek Realty, LLC, and the hundreds of millions of dollars in tax credits that have benefited Shepard and the Congressional crony he's married to: Democrat Claire McCaskill. According to what appears to be his LinkedIn profile, Shepard is the "Owner" of Sugar Creek Realty, LLC. McCaskill's disclosure lends some support to that fact. On page 16 of McCaskill's disclosure, we learn that Shepard's stake in Sugar Creek Realty, LLC, is valued between $500,000 and $1,000,000 and that he and McCaskill realize between $100,000 and $1,000,000 in annual rental and interest income from this one asset. Sugar Creek's "About Us" page explains what they do. The short version: Sugar Creek helps developers secure matching state and federal tax credits to finance their real estate development projects. Interestingly, their "Key Personnel" page (pictured at right) does not list Shepard. That page identifies the company's Chief Operating Officer (Kathleen Rorris), Chief Financial Officer (Stratton Whitaker), President (Chris Hite), General Counsel (Craig Towerman), and others, but oddly omits the company's Chief Executive Officer. Given that Shepard collects a salary and appears to claim to be the owner of the company, it stands to reason that Shepard is the CEO. In fact, business-lists.com identifies Shepard as the Chief Executive Officer of Sugar Creek Realty, LLC. That's how it goes with Shepard--even seemingly trivial facts are obfuscated. 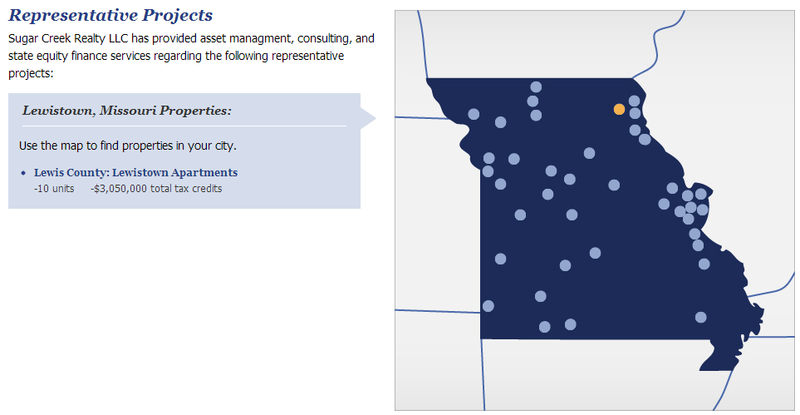 And that's why I found the "Representative Projects" tab on the Sugar Creek Realty, LLC, website so surprising. 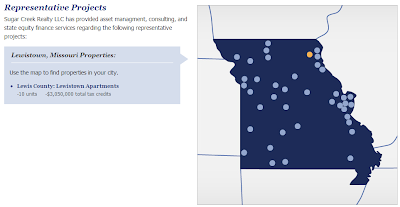 It's a convenient interface for looking through a representative list of development projects in both Missouri and Georgia--projects that Sugar Creek has facilitated. Click on a project at the bottom of that page and the number of units and the total tax credits for that project are displayed along with the project's location. Shouldn't these projects, these assets, be disclosed on McCaskill's financial disclosure? I compared the Sugar Creek project names to Part IIIB, Non-Publicly Traded Assets and Unearned Income Sources, of Claire McCaskill's latest personal financial disclosure (basically, pages 9 through 17). Column F, "McCaskill PFD? 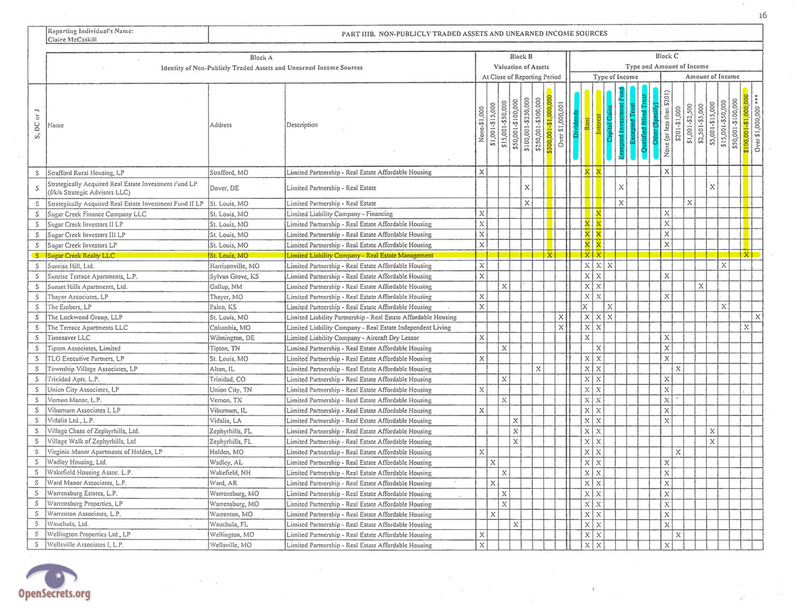 ", in my spreadsheet records what I found: none of the 79 representative projects from Sugar Creek Realty, LLC, was listed on McCaskill's financial disclosure though two Sugar Creek projects (Saddlewood Apartments and Woodlen Place Apartments) appeared similar to two assets listed on McCaskill's disclosure (Saddlewood I LP, and Woodlen Place Associates). Does Sugar Creek Realty, LLC, have an equity stake in any of these projects? I'm uncertain, but I believe the answer is yes for the following two reasons. First, Sugar Creek's business is to facilitate development projects with state and federal tax credits. I think that implies that Sugar Creek has an equity stake (possibly through one or more intermediaries) in these projects because the project developers need a buyer for their tax credits. A 2006 article about Shepard's myriad business ventures noted: "developers can sell their tax credits -- but only to buyers who own a share of the development." (See: *A Note About Tax Credits below for more on how tax credits work.) One reason that Sugar Creek might obtain an equity stake in a project would be to trade that project's tax credits in the secondary market. It's possible that Sugar Creek only held an interest for a brief time in order to acquire and trade the tax credits on the secondary market; however, I don't think that's the case. There's second reason to suspect that Sugar Creek has equity stakes in some or all of these 79 low-income housing projects. As mentioned earlier, Shepard and McCaskill realize between $100,000 and $1,000,000 in annual rental and interest income from Sugar Creek Realty, LLC. According to page 16 of McCaskill's disclosure (reproduced below), they do not receive dividends, capital gains, excepted investment fund, excepted trust, qualified blind trust, or "other" income from Sugar Creek Realty, LLC. I've highlighted those other types of income in blue below. I suppose it's possible that Sugar Creek's portfolio of properties could be composed of other real estate assets, but wouldn't they supplement that portfolio with the best new projects that they helped get off the ground? McCaskill's disclosure in conjunction with the Sugar Creek project data implies that Shepard has helped to direct hundreds of millions of dollars in state and federal tax credits for the construction of low-income housing while reaping at least a hundred thousand dollars and possibly as much as a million dollars annually from the rent payments and the interest on security deposits collected from low-income tenants. Missouri voters have a decision to make in November: do they elect the poverty profiteer Claire McCaskill or do they elect Todd Akin? I think it's time to curtail policies that have created our centrally-incentivized poverty-industrial complex which mints millionaires with tax credits. It's time for tax payers to tell Shepard and McCaskill: "You didn't build that and I'm finished financing it!" Sugar Creek's website is obviously a marketing tool for the company, so the data on it has not been scrutinized by an accountant. Nonetheless, because the company claims that it is "representative" I think it's safe to assume that it is representative and that it is a subset of their work just as that word implies. In other words, they've done more that $315 million in business, but we don't know how much more. While it's possible that the 10 low-income units at Lewistown Apartments were rehabbed for $305,000 each, I think that's probably not the case. Ok, I hope that's not the case. There were two instances where project names seemed to have prefixes: Lewis County and CONECT. Because of that and the fact that in both instances the tax credits were identical, I only counted the tax credit once. In other words, the total tax credits for the three projects above in my analysis is $3,050,000 not $9,150,000. It's possible that I missed other double counting issues in this data set. The website does not provide the start or completion dates for any of the projects or tax credits. That limits my analysis. For what it's worth, Sugar Creek Realty, LLC, was founded in March of 2001; therefore, none of this data is more than 11 years old. Some background on how tax credits work may be helpful. A dollar of tax credits can be applied to pay one dollar of your tax obligation. Because tax credits are often awarded in hundreds of thousand or even million dollar chunks, businesses awarded tax credits often have more credits than actual taxes, so they want to sell some, maybe even most, of their tax credits. Developers trade their tax credits for less than par value. A company like Sugar Creek might buy a dollar tax credit for only 40 or 50 cents effectively realizing a 50-60% reduction in that dollar of taxes. However, once tax credits are purchased from the developer, they enter a secondary market where anyone can buy them. So a company like Sugar Creek might buy tax credits from a developer for 50 cents on the dollar and then sell those tax credits to a bank for 75 cents. In that scenario, Sugar Creek is syndicating tax credits and realizes a 50% gain on its 50 cent investment. The reason that such large gains are possible in tax credit arbitrage is because syndication companies have a captive market--the development projects in which they've invested--while they are able to re-sell that investment to the broader marketplace. In short, the restriction that a tax credit can only be sold to a project investor only applies to the first sale of the tax credit, so the first purchaser realizes an immediate arbitrage advantage. Finally, tax credits are often awarded over a period of years. For instance, a project awarded $5 million dollars in tax credits might get that in five $1 million dollar chunks over the course of five years. When a syndication company purchases that $5 million dollar tax credit, they assume the time risk of the asset. So a company that buys that $5 million tax credit in the first year for, say, $2 million dollars, will only have $1 million of tax credits in that first year. They'll get the return on that investment in subsequent years--$1 million in tax credits each year for the next four years. BTW Akin was right about a woman's body shutting down. An egg (ovum) lives 12-24 hours after leaving the ovary. Ovulation can be affected by stress, illness or disruption of normal routines. Stress can definitely interfere with conception. That's because stress can affect the functioning of the hypothalamus — the gland in the brain that regulates your appetite and emotions, as well as the hormones that tell your ovaries to release eggs. If you're stressed out, you may ovulate later in your cycle or not at all. It's important to differentiate between constant and sudden stress. The body often acclimates to constant, everyday stresses, so you'll probably ovulate fairly consistently each cycle. It's sudden stress — a death in the family, an accident, divorce — that can throw your cycle off and interfere with ovulation. Pisarska tells WebMD that the effects of stress may be different for each woman. "Stress may cause one set of reactions in one woman, and something else in another, so ultimately the reasons behind how or why stress impacts fertility may also be very individual," says Pisarska. While doctors may not know the exact links between stress and fertility, a series of studies shows the impact is hard to ignore. Q. Can emotional stress affect fertility? A. Severe stress can prevent ovulation, and that, of course, makes it impossible to get pregnant. Significant stress can affect the hormones in the brain that direct egg development; the eggs stop growing and there’s no ovulation.